Yeah, it's another one from the 20s - I've had some luck filling a few gaps in my collection in the past couple of weeks. 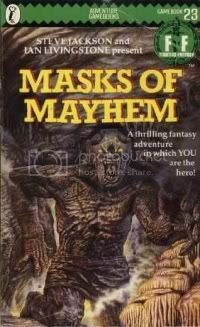 I had no idea what to expect from Masks of Mayhem, except that I'd heard it wasn't very good. Well, I enjoyed it enough, though it wasn't particularly memorable, at least the journey I took. Apparently there's a big twist if you make it all the way to the end, but I didn't, so nyargh. Anyway, you play as the ruler of Arion, and for some reason you decide to wander off into the unknown in order to defeat an evil sorceress by yourself - Arion can't be much of a kingdom, if there's no one you can pay to do it on your behalf. The book says only the reader can undertake the mission because of a 'purity of purpose'. Huh? After a little pep talk from my Welsh wizard Ifor Tynin and my armourer Truehand, who both seem to know far more about this mission than I do, I wandered north into perhaps the emptiest region of Khul (if the supplied map is anything to go by). It apparently took five days to traverse the first centimetre of green space. Hmmm. This could be a long book. Heading west around Lake Nekros, I wandered into the forest soon found myself the target in a game of William Tell being played by some Wood Elves. They took me to meet their chief - I asked for safe passage through the forest, hoping to end up on the other side in Fallow Dale, but instead they dumped me on the complete other side of the lake. Thanks a lot, jebus. It's all misty and I can barely see a a few feet in front of me, but head on anyway - I grew up in Hamilton, perhaps the only city in the world with a statue of Riff Raff which is still far better known for its fog. It pays off when I come across and defeat something called a Wight, which is basically a floating, melting zombie with an open firetop skull. I got the impression if I could just tip it over, its brains would fall out and I'd get to take its ancient, skill-enhancing sword without as much of a fight as it put up. Onward, the mist got thicker, and the book ignored my Hamilton experience and fell me down a hole, into a mine, where I found a green copper nugget. How... odd. Anyway, I soon came across a pool of water I decided to jump, and here the book fucked me off. I had to test my luck, instead of my skill, then when I was lucky, I was told to test it again - with no explanation - was unlucky, and apparently cleared the pool but landed on a slippery piece of lichen, and killed myself in the fall. Funny, cause I just fell down a freakin' mine shaft, and only lost a single stamina point. I decided this was silly, so solved it in a matter just as silly - I pretended that after passing the first test of luck, I wolfed down my potion of luck before now successfully missing the patch of super-slippery lichen. So, out of the mine, I arrive in Fallow Dale and immediately hit the pub. Unfortunately, Masks of Mayhem has a real obsession with food, one of the examples being the only thing I can do in the pub, if I so wish and can afford to, is eat. In the immortal words of Gob, come on! I meet up with the local king, Hever, who's holding some kind of banquet. I eat (for about the thirty-seventh time) and get drunk, and retire early. Somehow the feed gave me stamina, but also made me want to sleep - go figure. Now, Hever apparently has this magic horn I need, but he won't give it to me unless I track down this sabre-tooth tiger that's been harassing his peasants. So, I get a pack of dogs and we head into the forest - the book lays out a gameboard, and through a sequence of dice rolls your dogs pick up and lose the scent, the tiger wanders around, it's all luck though so a quick roll would have sufficed, no? Anyway, it's actually kind of fun, and I catch up to the tiger just in time. I set my dogs on him, who apparently are invincible as they savage him without any chance of being hurt back, but strangely despite this I apparently call them off the attack so I can finish it off. Bad choice - at least it would be, if I had one! The dogs were doing a great job, I was hopeless against it. This time I was well and truly killed - though it only had a single stamina point left, I didn't feel another 'oh but I was so close and hard done by' reasoning was appropriate. So, Masks of Mayhem - it didn't feel like anything special, but it certianly wasn't the disaster I was dreading. The writing was a bit flat, the journey at times even felt a little empty, but there were characters with a bit of substance, and if you avoid the odd bits (if that' possible) and eat plenty of food, it could work, yeah. I'm not kidding about the food, by the way. I haven't mentioned it much, probably cause I'm so sick of reading about it! This was one of the books that was a mixed bag to me. Simply put, I enjoyed playing this....but not winning it. The ending lacks the flavour that's actualy present in the rest of the book and is really anti-climatic. The final puzzle took me forever to figure out. Without spoiling anything, it requires you to figure out a certain someone's identity. But the diffiucult part isn't actually about figuring out his identity, but the fact that even if you figure out who it is, there's no clue as to where you should turn to. It's easy to figure out who it is, but it was years later before I found out the reference I was supposed to turn to, and there was no real clue in the book concerning that. Like I said, a mixed bag, the final "puzzle" (if you can even call it that) was diffiicult, yet the ending was just completely unrewarding to read. Enjoyable to play, but not to win. Oh, and one of the neccessary objects you need to win was so hard to find that your chances of finding it was pretty much random. The Tiger Hunt is fun, but I usually skip that unless I have lots of skill and stamina to kill, because again, it's unrewarding. The item you gain from it doesn't actually help you that much, considering if you can beat the tiger your skill score must already be pretty high to begin with (ironically a character with low skill would have benefitted more from that item). I actually got given this and several other books the other year, but they were full of dust BIG STYLE, and they made me sneeze too much to enjoy. So WHAT is the answer to the final riddle (I mean not WHo the traitor is but how to get the number)? I never found out. >>The final puzzle took me forever to figure out. Without spoiling anything, it requires you to figure out a certain someone's identity. But the diffiucult part isn't actually about figuring out his identity, but the fact that even if you figure out who it is, there's no clue as to where you should turn to. It's easy to figure out who it is, but it was years later before I found out the reference I was supposed to turn to, and there was no real clue in the book concerning that. Oh God, that drove me nuts. I kept trying the old trick of converting his name into a number via A = 1, B = 2, etc, but that got me nowhere, and I eventually resorted to flicking through the book until I found the right reference. Years later, I realise there actually is a clue in the book. Take the last three letters of his first name and the first two of his surname and they spell out a number. A clue is supposed give you an idea at how to arrive at the solution. This 'puzzle' essentially requires you to figure out the answer without giving you an actual 'riddle' or 'equation' to work with. The only way for the reader to solve this if he happens to possess the same kind of mindset as the author to be able to see things the author meant him to.